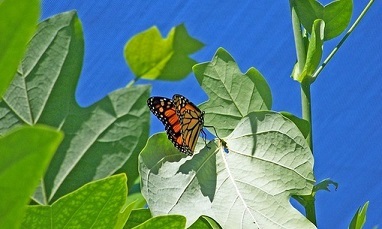 When was the last time you saw a Monarch Butterfly? When I was growing up I saw many beautiful Monarch butterflies and I also saw lots of milkweed plants growing everywhere.... those seed pods attached to that feathery cotton could be found blowing and drifting in the air...at times it was almost as if it was snowing. I just don't see that anymore.. Do You? In 2002 up to 270 million Monarch butterflies, about three quarters of the worlds population were killed while wintering in Mexico. The Monarchs froze to death as a result of three days of rain and sub freezing conditions. The use of insecticides and herbicides has eliminated much of the Monarchs habitat. The milkweed plant that the Monarch depends upon for survival, is disappearing as meadows, prairie and farmland are developed. A combination of severely depleted numbers of Monarchs and a scarce food supply have resulted in not being able to see these beautiful orange and black butterflies as they flutter gracefully around us. The Ida Civic Club has launched the Monarch Butterfly Project. The Monarch Butterfly needs help with its food source... the milkweed plant. I have heard many people say they would like that name changed to Milk Plant... the "weed" on the end of its name makes it sound like a pest plant.... it is far from that. The Monarch Butterfly needs it to survive. Milkweed seed packets are available so that you can plant your own seeds to help the Monarch Butterfly. You can start them inside NOW or simply plant them outside when the weather gets a bit warmer. I am sure you have a space for a butterfly garden...or an area that you can set aside to help the Monarch Butterfly. This fundraiser is part of Ida Community Day...Please join us May 18th, 2019 for all of the festivities. The seed packets are available to pick up in Ida at Old Country Treasures and Ida Veterinary Clinic.. If you are not able to get to Ida to pick up the seed packets.. please use the contact form. For an addition small fee I will be happy to mail you the packets. Any money raised over the cost of the project itself will go toward the Ida Civic Club Scholarship fund. Do You Want To Purchase Your Own Seeds....? The Mission of the Foundation is to keep the skies filled with Nature's colors.